The no 1 French pharmaceutical brand. Harnessing the anti ageing and antioxidant properties from grapes and the grapevine, Caudalie has four patented ingredients which fight against the signs of ageing. Combing all of Caudalie’s patented ingriedients and a micropoint roller to treat and prevent all of the signs of aging. Visible results immediately. Using patented resveratrol from grapevine twigs and resveratrol oleyl, this facial plumps and firms the skin, stimulates collagen and elastin and diminishes wrinkles. Using patented viniferine from grapevine sap, this facial erases dark spots, prevents their appearence and restores radiance and lumininosity to the skin. Using patented grapeseed polyphenols, this facial fights against oxidants and free radical and prevents the signs of ageing. Energizing and vitamin rich, the skin is moisturised, radiant and protected. 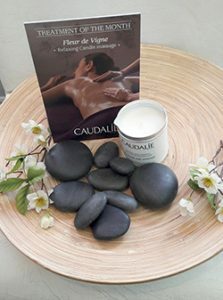 An introduction to Caudalie. This facial promotes luminosity and radiance. Immediate effects seen with ongoing long term results.